The first minute book of the lodge is dated on St. John’s Day, 27th December, 1755 when the lodge met as ‘Rutherglen Kilwinning Lodge’. The first Master was Patrick Fife and it was written into the minute book that the lodge “be regularly convened and opened on every St. John’s day yearly and thereafter quarterly”. The minutes of meetings were very brief in those days and records only that a meeting was held and names of those attending. It is noted that the master was titled the ‘Grand Master of the Lodge’ and not the Right Worshipful Master as is the title today. Around the time of 1781 the lodge was know as ‘The Lodge of Rutherglen Free Operatives’ and the minute of March 23rd records that the lodge ”gave out a Mark” although it doesn’t state who the Mark was given to. The Master of 1782, William Park called a meeting of the Lodge but then didn’t turn up at this meeting so the Brethren fined him “two Shillings Sterling.” which was a considerable amount of money in those days, also a brother who didn’t attend the annual St. John’s meeting was fined for “having no lawful excuse why he did not attend”, just as well that we don’t carry out this practice today on all office bearers!! The minutes start to give more information and on 5th December 1794 the minute records that a Brother Robert Rodger having been advance in Masonry was raised to the degree of Master although the minutes still only gave 5 or 6 lines of information. The name of the Lodge appears to change on 27th December 1826 when the minutes states that ‘The Lodge of Rutherglen Free Operatives St. John’ met to celebrate the life of St. John the Evangelist but by 19th January 1827 the name has changed slightly to ‘The Rutherglen Free Operative St. John’s Lodge’ and this minute shows the title of the master to be the R.W. Master. Later that year on 30 March the lodge was honoured by a large deputation from ‘The Rutherglen Royal Arch Lodge in their clothing’ and these visits are still an annual event to this day. By the time the lodge received it’s charter on 30th November 1846 the name appears as’ The Rutherglen St. John’s Operative Lodge’ with Bother James Croft as R.W.M. and met in the Council Hall in the burgh. The first record of the lodge being known as ‘The St. John’s Operative Lodge Rutherglen’ was in the minute of 16th July 1847. On 9 April 1851 the lodge met with the brethren of The Rutherglen Royal Arch Lodge at ten o’clock in the morning and walked in procession from the town hall to the Cathedral of Glasgow where they met with other sister lodges where they heard an excellent sermon preached by the Rev. John Leckie after which His Grace the Duke of Atholl, Grand Master Mason, laid the foundation stone of the Stockwell Bridge with all Masonic Honours. The brethren travelled by train to Stirling on 24 June 1861 to assist in the laying of the foundation stone of the Wallace Monument at Abbey grange and also in July 1862 the lodge met with sister lodges to walk in procession to the United Presbyterian Church in Rutherglen where the Rev. William Beckit delivered a suitable sermon before the lodges attended the laying of the foundation stone of Rutherglen Town Hall by Bro. Sir Archibald Alison, Depute Grand Master of Scotland. A ceremonial dagger was presented to the lodge by Brother George McCall in September 1868 that is still used in Entered Apprentice degrees today. In August 1874 The brethren and ladies of Lodge St. Barchan No. 156 joined with our members and ladies for refreshments then walked to Burnside for their annual outing. The first hall dedicated for the use of Freemasonry by our lodge had the Foundation stone laid in Cathcart Street on 6 March 1875 when approximately 800 members representing 28 lodges plus Grand Lodge and Provincial Grand Lodge were present. The Temple was consecrated in November 1875 by Bro. Colonel A. Campbell, Provincial Grand Master. The first lodge meetings to be advertised were in the Glasgow Evening News in 1894. The first recorded Divine Service took place in Wardlawhill Parish Church on 14 June 1903 when over two hundred brethren joined the congregation for worship and in 1912 four hundred attended a joint Divine Service.The Lodge donated £30 towards the building of the new Grand Lodge Hall in Edinburgh in 1910.During the first World War the average attendance was 110 per meeting with 30 meetings per year and 150 candidates. A number of brethren were killed during WW1 including 2 PM’s and the IPM was hospitalised in Egypt and later killed in action in France.At the outbreak of World War two the Lodge Temple was taken over by HM forces and we met in the WP church hall then in the ‘Rechabite Hall’. Bro. Rev. P. Hamilton was among many brethren who were killed in action during WW2. Our contribution to the Provincial Grand Lodge of Renfrewshire East was started by Bro. William Brough P.M. who was our first member to reach Provincial Grand Senior Warden followed by Bro. William Scott P.M. as PGSW in 1929, Bro. G. Hollinger in 1961 and Bro. D. McLelland was the last brother to serve as PGSW. Bro. J. Ian Duncan was commissioned as Provincial Grand Secretary by Bro. Frank Johnstone PGM. In 1936 it was agreed to provide the PGL deputation with a steak pie meal, cigarettes, twenty five cigars and liquor – the bill of which not to exceed £2. Brother George Munn P.M. presented the Past Masters board to the lodge on 14 September 1945 to mark the end of WW2. A coat of Arms was designed and approved by Lord Lyon to mark our centenary in 1946. The centenary installation was held in Rutherglen town hall and a church service the following day in Stonelaw Church. Bros. J. Steel and R, Brown received Honorary rank of Grand Lodge Bible Bearer. Bro. John Morrison P.M. Honorary Grand Architect in 1965. Bro. W.A.C. McInnes received Honorary Grand Director of Ceremonies in 1990 and Bro. J. Ian Duncan received Honorary Grand Assistant Secretary in 2002. The present Temple in Melrose Avenue was opened in 1971 and Bro. John Hunter was the first master to be installed in these premises. The lodge premises have been upgraded on many occasions and is in regular use. After various deliberations after the war it was decided on 15.10.48 that the memorial should take the form of a Masters chair and negotiations were entered into with the firm of A.A. McIntosh of Kirkcaldy to manufacture same (as far as I can see for £75). It was suggested by the lodge that what was the known as purchase tax should not be charged for the work as it was a war memorial but that was turned down by the authorities at the time. 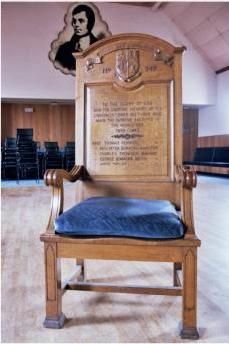 The chair was purchased from lodge funds and was not – as some other artefacts in the lodge – donated by a brother or group of brethren. Instructions to proceed were given and meetings were held with the firm’s representatives on aspects of the design – for example it was decided to increase the height from 4’6” to 5’. The design was finally approved on 9.4.49 and firm instructed to proceed on 13.6.49, the chair to be delivered on 12.9.49 – to be unveiled 21.10.49 (it would appear that the chair originally had a cover). The chair was finally unveiled and dedicated on 18.11.49. The RWM Brother James McNab presided and the clergymen present were Bro. Rev. James Wotherspoon, Chaplain Provincial Grand Lodge of Glasgow and Bro. Rev. William Wright, Honorary Chaplain Lodge 116. The Last Post was sounded on the bugle followed by Flowers of the Forest on the pipes, then the Dead March from Saul on the organ. There was then one minutes silence, after which the Reveille was sounded. Both ministers gave suitable sermons and the occasion was certainly a moving one. Summary of NamesGeorge Kinnear Smith, Sergeant Royal Artillery, age 33. Date of death 2/7/45.John Taylor, Signalman HMS Nordhav II, age 30. Date of death 10/3/45.Charles Maharg, Lance Bombardier Royal Artillery, age 33. Date of death 11/8/44.Peter Dunachie Hamilton, Captain Highland Light Infantry, age 33. Date of death 25/1/41.Thomas Fenwick, Steward S.S. California, age 42. Date of death 11/7/43.Thomas Fenwick, Sergeant Royal Air Force Volunteer Reserve. Date of death 7/10/44.